This is the final installment of my December Daily album. You can find the other sections below. I want to thank all of you that have come to check it out, it means a lot. I love this project and if I only did 1 project a year outside of Project Life, I think it would be this one. I love it so much and I love Christmas. Day 26 was spent packing up the dishes in the cupboard and washing the new ones we got for Christmas. Jon made dinner and we curled up on the couch with Gracie to watch a movie. I stapled a cork 26 onto the plate and added some filler cards and a journal card to the lef page and called it done. The card is from like 2013 and the chipboard piece was from the 2016 chipboard bundle. Looking at it now, I feel like I need to add something around the chipboard piece. Either another pattern, or some journaling, or a stamp maybe. It just looks too white. Day 27 was so ridiculously cold that I had to include not one, but two weather screenshots. 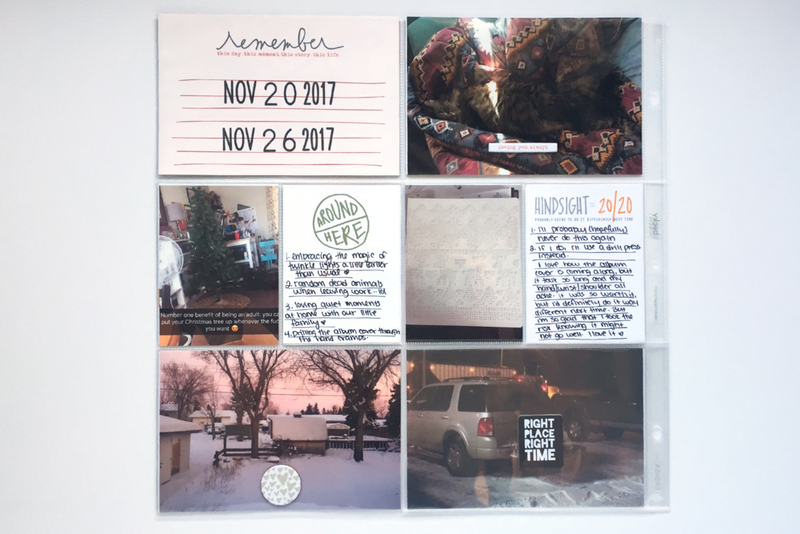 I created a 4x6 canvas in photoshop with a 3x4 text box to keep my journaling from running over any of the words on the journal card. I just wrote about how cold it was and how we stayed inside for the whole day. I added some phrase stickers and a chipboard heart to fill in some of the white space. I could have measured sections of the journal card to get the text closer to the words, or just hand wrote my journaling, but I love how it turned out. I realized when I was photographing this that I forgot to add a tab to the edge of that half page. I'll go back and add one when I remember. Day 28 I babysat my niece and nephew. We built some Lego sets they'd gotten for Christmas and made some extra crowns which then led to a mini photoshoot with the two of them. Which was freaking adorable. I repeated the cork number over a plastic shape that "framed" the number. I love how it looks and it fit perfectly in the top right corner. I included a single 6x8 photo of each of them, and one 3x4 of the two of them, and an extra 3x4 of my niece while we were playing Wii Tennis. I added in the "Oh what fun" card, I'd used the letters previously in the month. Day 29 it was EVEN COLDER than Day 27 and so of course that needed to be documented. I stapled the 29 to a pattern card from Feed Your Craft and added my journaling and called it done. I added a full 6x8 photo of Gracie that is technically from Day 30, but I didn't label it, so it kind of falls into Day 29. Day 30 we had Christmas with my family. Jon and I took care of making dinner, my niece and I had made some Christmas crackers for everyone, including crowns. I typed a novel of tiny journaling and printed it out on this card. I made a 4x6 canvas, measured the space at the top and created a text box to fit the open space, printed a test run and then printed it onto my journal card. 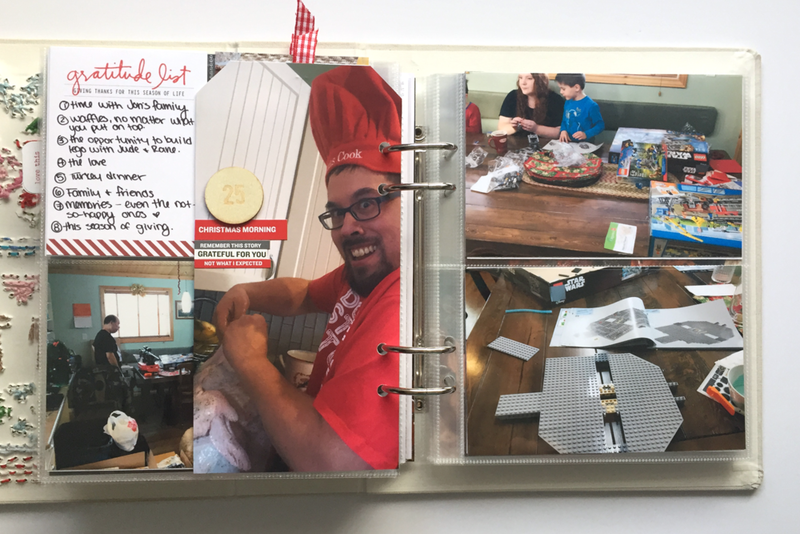 I added a photo of my nephew playing with the road puzzle I bought him, and an adorable photo of my brother and his family playing Connect Four. On the right I slipped two of the crowns into a 6x8 pocket. I trimmed them off at the top of the pocket - they were a little too tall, and fused along the edges to hold them in place. I just fused along the edge of each crown, following the diagonal and dumped some sequins into the open space in the middle. If I did it again, I think I'd fuse one small section at a time and add the sequins as I go, but it worked out in the end and I love how it turned out. Day 31 Jon and I had to work until 8, and then we went to play Yahtzee with his parents. I just took a photo of my score sheet, stapled the number to the bottom, wrote who won along the bottom and journaled a little bit. I added Jon's score card to the back page and called it done. Thank you so much for looking at my pages. I super love this cover and will absolutely consider doing it again now that I know what it takes. Or maybe I'll just let this be the only one for a while and just enjoy it as it is. Please feel free to leave links to your projects in the comments, I'd love to see them! Seriously you guys, that cover makes me so happy. Even though the bottom rows have a very pronounced curve to them. You can read more of my ramblings about the cover in PART 1 and a little more in PART 2 and don't forget to check out PART 3. Day 22 is all about the last shift of work before the holidays. I meant to include more about what we did aside from work, but instead just slipped in a photo from The Grand Tour o remind me that we watched it that night after work. I added a white heart sticker and stapled the cork number onto the December card and called it done. Day 23 was the work Christmas party. I put some of the photos out of order, but I'm still happy with how it came together. This photo of Jon and his parents with Santa is super blurry, but I made it black and white and love how it came together. I stapled the cork number and a plastic circle from the 2016 Paislee Press kit to the top edge of the photo. I love that by "framing" the number, it draws your attention to it. Day 23 continues onto the next page with a full page selfie. When I was looking at the photos I'd taken from this day and trying to put the spread together I was all "do I really need a full page photo of my face (okay, half of my face)? The answer was yes because somehow I'd managed to get to the day 23 with a single photo of myself. I have my feet on Day 1, and a photo of my face on Day 3, but that's it. This is a project about me, and my life, and yet I'm in a total of 1 photo with my face. It's not that I don't know how to get myself into photos, I simply avoid them - like the Santa photo on the previous page. I don't feel comfortable being in front of the camera and over the last 5-6 years I've noticed a decline in the number of selfies I take, and photos I appear in. So all this rambling to say yes, yes I did need a full page photo of myself, with a gold embossed 23. I actually really liked this photo right after I snapped it, and I still like it. Trying not to pick out all of the details I hate about it. I added one of the gold foil tags and stapled one of the phrase strips from the main kit to a felt heart, also from the main kit. I stapled the phrase to the heart and used glue dots to adhere the phrase strip to the tag. On the back of the tag I journaled about the Christmas party. I added some phrase stickers to the top and the same ribbon that I used on the first tag. I added some additional photos from my walk to the party on the page to the right, with a transparency from the Paislee Press mini kit. Day 24 we went to Jon's parents' for dinner since work was officially closed and we really didn't want to cook, but his mom was making dinner for everyone. 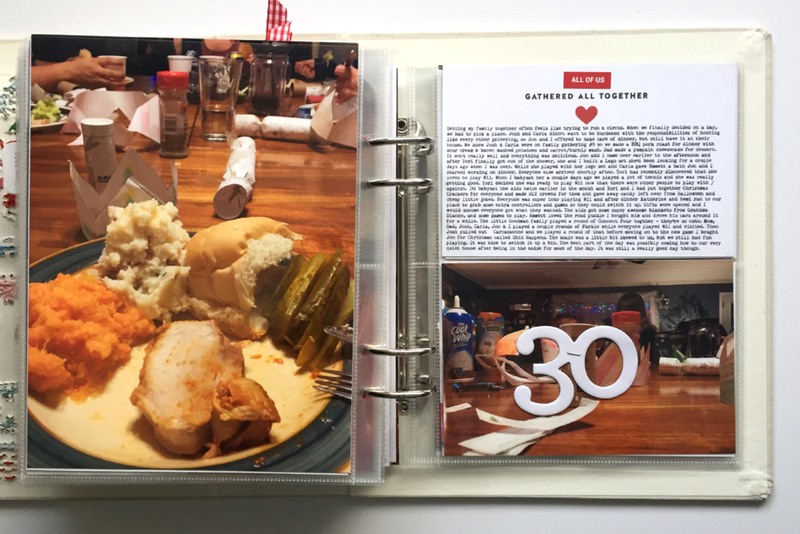 I kept things pretty simple since I knew Christmas Day was coming up and I had a ton of photos and the album was already getting a little bulky. I added an acrylic piece from Color Cast Designs (it's from 2015 I think) to my large sunset photo. I tried to get it in the middle-ish and I love it's contrast against the colours of the sunset. For most of December I'd wanted to capture the reflection of our tree in the livingroom window, and I finally did on Christmas Eve. We'd come home early-ish from Jon's parents because we were going out early the next morning so the kids didn't have to wait to open gifts. I told the story about how on our way home, it was so cold outside that we hit a bump and a rock chip on the truck window turned into a crack along the bottom of the window. Yet coming home to the reflection of the twinkle lights made everything better. The wood veneer 25 is from 2013 or 2014 (super old) and I slipped this transparency that I cut down to 3x4 into the pocket with it to just make this side of the pocket feel completed since I was leaving the wood veneer raw. Day 25 starts with the ridiculously cold weather and a story about picking up Jon's Aunt on our way back out to the farm. Then we move on to the mess that is large presents for everyone that don't fit under the tree. I love how the wood veneer and the transparency look from this side. That transparency is hands down one of my favourites. Then I journal a small gratitude list that covers a lot of the things that were going on at the Wong house on Christmas Day. I included a photo of breakfast (bananas and caramel on waffles), and a photo of most of us crowded around the table working on Lego. I added another of the tags with the same ribbon as the other two. #2 on this list was because Jon had bananas and caramel and I simply put maple syrup on mine. There was teasing about this, but I stood my ground. I love gratitude lists because they remind us that we're really blessed to have what we have and shouldn't take any of it for granted. I will probably always tease Jon about this photo of him getting ready to shove his hand into the turkey. I love it though. I love that it captures his sense of humor and that he's usually the one to stuff and take care of the turkey when we have dinner at his parents' house. On the right I added some photos from the adventure that was building Star Wars Lego sets with the nephews. They were pretty excited. On the back of the tag - where I put the photo of Jon - I added a wood veneer 25 and some phrase strips. I added another Lego photo and a photo of the fort they built. It was so much cooler than anything we had as kids. I usually try and include a photo of Jon's turkeys in any projects I'm doing, and this is no exception. He loves making the turkey. This one got a little bit too crispy on some parts because for some reason it wasn't cooking as fast as it should have been, and had to stay in a little longer. But it was still freaking delicious. To finish off Day 25, I wanted to print out a 6x8 photo of everyone gathered around the table, but I don't have it yet. Jon's dad took it with his DSLR and hasn't had a chance to e-mail it to me yet, but I'm saving it's place anyways. This might stay like this until I forget what was supposed to go here, but that's okay. On the right I wrote about a day of Lego building and included photos of the two BIG sets we helped the boys build. Thanks so much for coming to check out my December Daily album. Please feel free to leave a link to your project in the comments. I'd love to check it out, whether it's a blog post, some videos, or just photos in a gallery. This cover will possibly forever be my favourite until the end of time. I'm so so so glad that I did it. I love it's messy little flaws and crooked lines and I absolutely want to stitch it onto a traditional layout - that's how much I love it. The two previous posts covering days 1-13 can be found at the links I shared above this photo. Today I'm starting with Day 14. It took me almost half the month to get the first gift wrapped. When we were in the city earlier in December we found this really great wrapping paper. The roll had EASILY 300% more paper than any other roll I've ever seen. I was able to wrap every single gift that needed wrapping paper and still have enough leftover to get through next year. It made me happy to see it under the tree with THESE REALLY GREAT TAGS that I found on Pinterest. I trimmed a piece of wrapping paper to 6x8 and adhered it to a piece of cardstock before adding the tag and slipping it into the pocket. Day 15 was a short story about how LITTLE snow we have. Which is freaking ridiculous for where we live. In Alberta. Which, if you don't know, is in Canada. It was unseasonably warm for most of December and what snow we did have mostly melted by this point. It did snow again later in the month and we had a mostly white Christmas, but it also got ridiculously cold towards the end of the month. Day 16 was all about Gracie. She gets super cuddly in the winter, and yet still holds the firm belief that the couch belongs to her. When both Jon and I are at home for a full day, most of it is spent at our desks working on our respective hobbies and Gracie curls up on the couch and looks adorable, always. 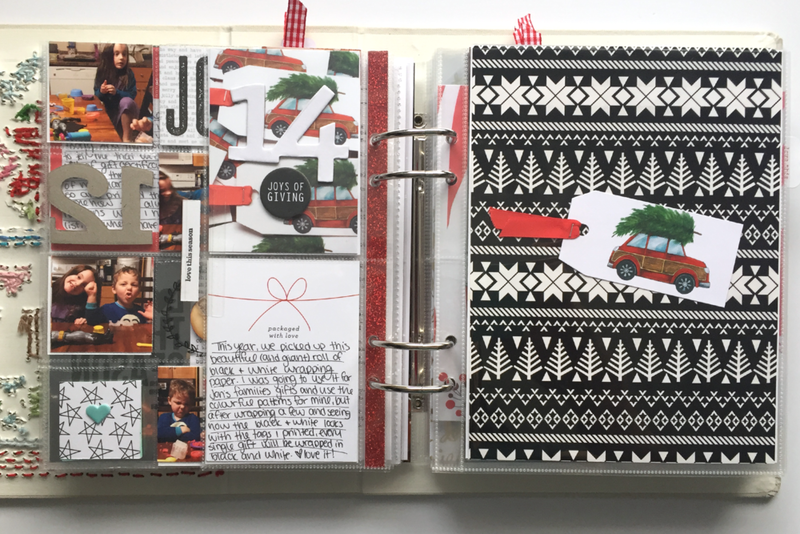 I used a card from the 2015 kit and some giant letter stickers from my stash to write cozy and journaled under it. Day 17 I printed out a digital 4x6 card from the For the Love Story Kit (learn about Story Kits and Stories by the Month) and used a variety of stamps to make a list of things I love about this season/photo/day. 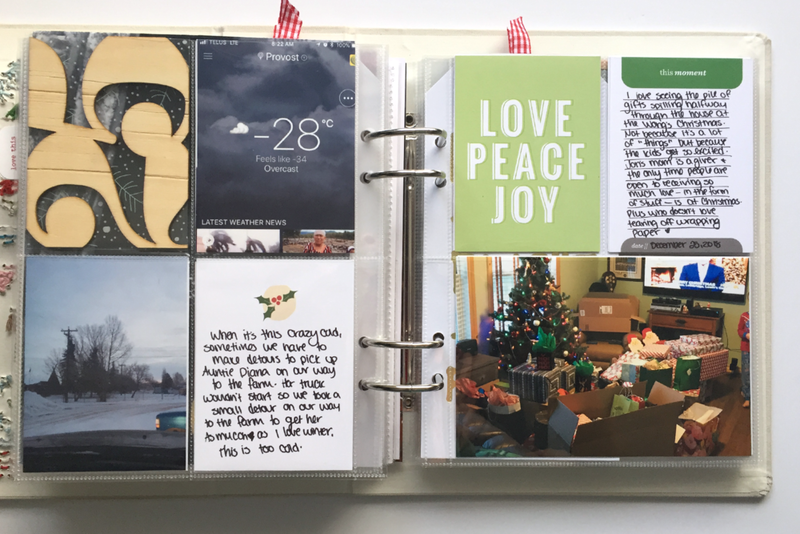 I added an older "December routines" card to journal about the mundane details of our life right now. 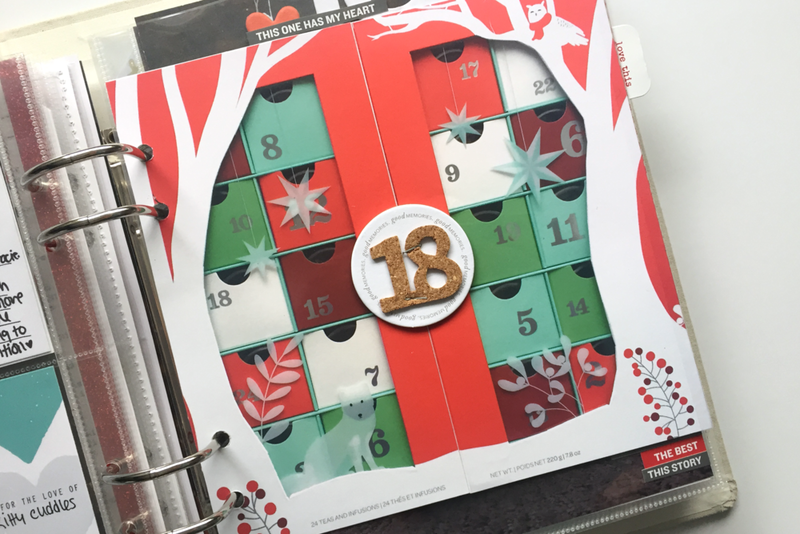 Day 18 is supposed to be an interactive advent calendar, which I scrap-lifted from the always lovely Brandi Kincaid - you can check out hers HERE and catch a video walk-through HERE. I stapled the cork heart to the red heart, hand wrote "kitty cuddles" and stamped all the rest of the list. I love this card and will most definitely be using it over and over again. So many ideas to use this card like 60 times. 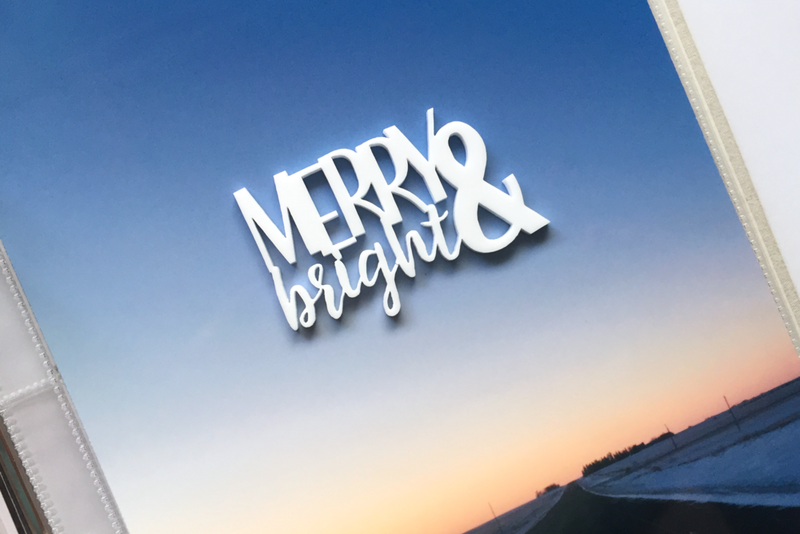 I just took a photo of my advent calendar and cropped it square-ish in Photoshop and I printed it out on Matte photo paper. I cut it in half down the middle and adhered the left side directly to the cardstock backer and made the right page flip up so I have space to include the notes about how each of us feels about each tea. It's a work in progress and I'm hoping that this piece is finished before this post goes up, if not I'll try to remember to post a little update with the finished product. Day 19 is all about my two favourites being weird but also adorable. 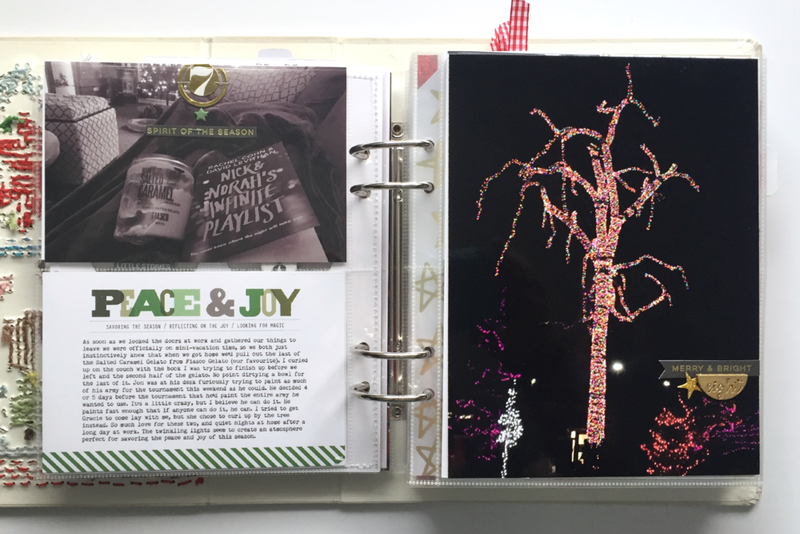 I cropped the left photo to the size of the advent calendar on the other side, and thanks to a poll on Instagram all of my full pages outside of the pocket have been printed on Matte photo paper. I stacked some phrase strips along the edge of the full page photo. I stacked some more on the photo on the 4x6 photo on the opposite page. Because we had a very not-busy-with-holiday-stuff December, Day 20 was about finally getting 99% of the gifts wrapped and under the tree. Jon still had to wrap all of my gifts, but I'd gotten through wrapping all the other gifts, so I snapped a photo and wrote a little bit about it. Day 21 was all about packing up the holiday baking that needed to be delivered to a few people at the work Christmas party in a few days, and because Christmas was quickly approaching we had to get some ready for Jon's family. Luckily we chose something we wouldn't have to worry about going bad or stale before delivery. I peeled the chipboard number to make it thinner and wrote my journaling on a heart with little stitch marks embossed around the edges. I added some gift die cuts from this Feed Your Craft set and adhered everything to a card with some text on it. 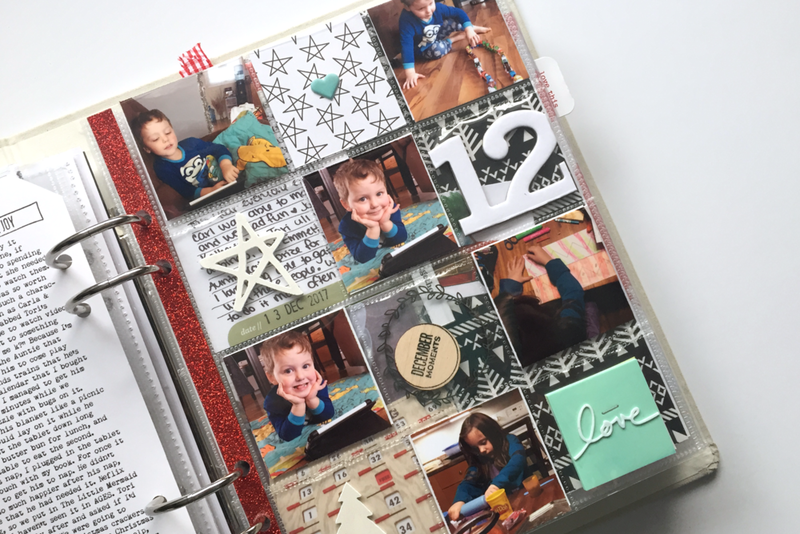 I don't often heat emboss anything, but I did a reasonable amount of embossing in my December Daily album. This circle was a wood veneer, but I didn't like how the raw wood looked against this pattern, and so I took some white embossing powder and embossed it before adding the number 21 puffy sticker from 2016. The photo of the boxes was just printed as a 4x6 and I cut it in half down the middle and slipped it into the 3x4 pockets. I adhered this rubber holiday cheer banner outside of the pocket and went right across. I thought about putting it inside, but it wouldn't cut in half nicely, and it would have made the pockets too bulky because it would have been right on the center line, so I left it whole and hopefully it stays attached. I might go back and add a staple or two just to make sure it doesn't fall off. Thank you so much for coming by to see my December Daily album. In an effort to get this project shared before spring is upon us, I'll be sharing the final two parts of this album on Monday and Tuesday. I hope you all have a great weekend. Feel free to leave links to your December Daily projects in the comments. I'd love to see them! 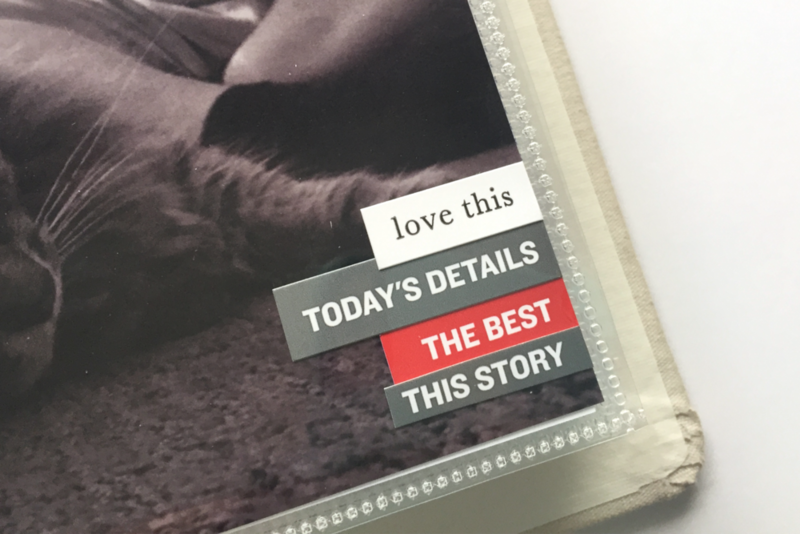 When Ali does a Project Life catch up, she talks about "formulas" and one of her formulas is repeating an embellishment across a spread. I've got a literal ton of chipboard pieces from past Story Kits and various chipboard bundles and other kits Ali has released. 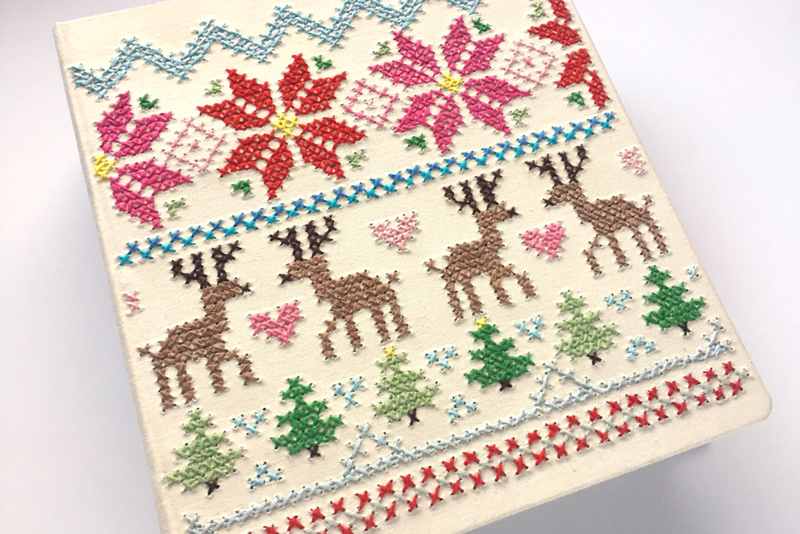 I also added in a 3x4 card from an old Feed Your Craft kit. This week we put up our tree, I finished drilling my album cover and got ready to stitch it. The "right place right time" chipboard piece is hiding a dead animal. We came out of work after closing and someone had been hunting earlier that day and just strapped their animal to a rack on the back of their vehicle. I laughed out loud and insisted on taking a picture, but knowing it might be sensitive or offensive, I added a flip pocket and stuck the chipboard onto a piece of clear plastic and slipped it into the pocket to hide it. So many words. I took a box of old stickers and die cuts and things to my niece and nephew. They were so ridiculously excited. I put together simple little books for them to put their stickers into and it kept them entertained for at least an hour. We had so much fun. Alright, today I'm sharing Part Two of my December Daily album. Part One is a very long and rambling post where I talk about this awesome cover that I created. 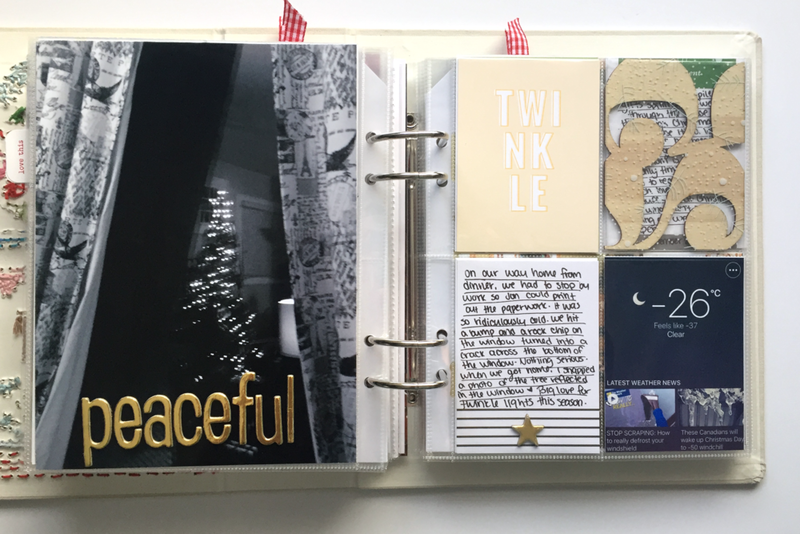 I however, forgot to mention in that post that this album came with Ali's 2014 December Daily kit (no longer availabe) and I stared at it for so long until this idea came to me, and I'm so grateful that I waited until inspiration struck and this became the result. I LOVE how it turned out, flaws and all. 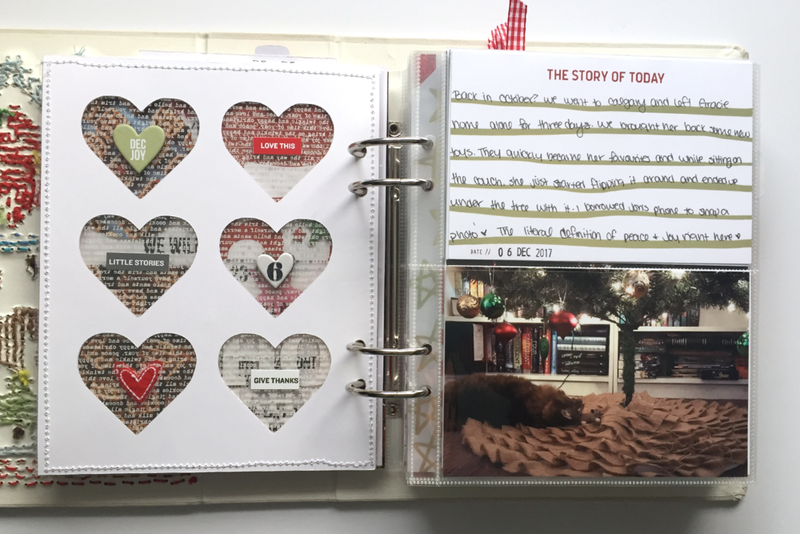 Day 6 starts off with the back of the heart page I made with a cut file and tutorial from Ali's December Daily Product Play Workshop - more about it below. On the right side I wrote a little bit about the photo of Gracie playing under the tree with her mouse. She loves that burlap tree skirt that Jon's cousin made us, and spends a lot of December under the tree. She really hates when I put presents under there and she doesn't have space to lay down on the tree skirt. I stamped a number 6 onto one of the hearts (okay 2 because the first one smudged), and repeated the same format that I used on Day 5. I tried to match the size of the phrase stickers, but I know the "give thanks" one on the bottom right was a little taller than the one on the other side, but it wasn't a big deal. Day 7 was the definition of peace & joy, so I felt great using that card. I created a 4x6 template in Photoshop and measured the space for my journaling and created a text box. 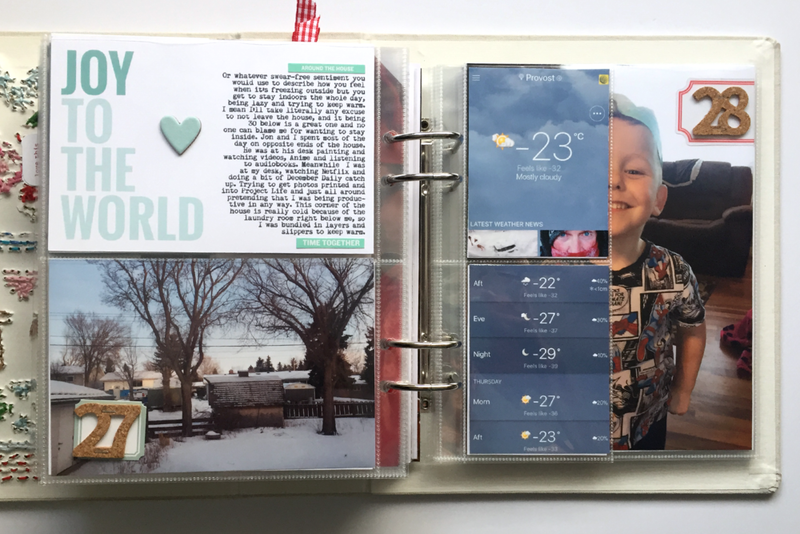 I printed it out on plain paper with registration marks and then just stuck the journaling card down where I wanted the words to print and hoped for the best. Luckily it worked out great. The full page photo is for day 8. We went down to Calgary for our third visit to Zoo Lights. We (mostly me) look forward to going each December. It's the one place we can go and enjoy some really great light displays. In our small town, not too many people do anything elaborate with their Christmas lights, so it's absolutely worth the drive to see the zoo decorated for the holidays. I stapled the gold circle number, and a phrase strip to my photo and added a little green chipboard star. Super simple, but ties the green to this photo and repeats the gold on the photo for day 8. I trimmed a phrase strip from the main kit into a banner shape and adhered it right along the edge. I added an old glitter star sticker and dug into my number stash for that half circle wood veneer. 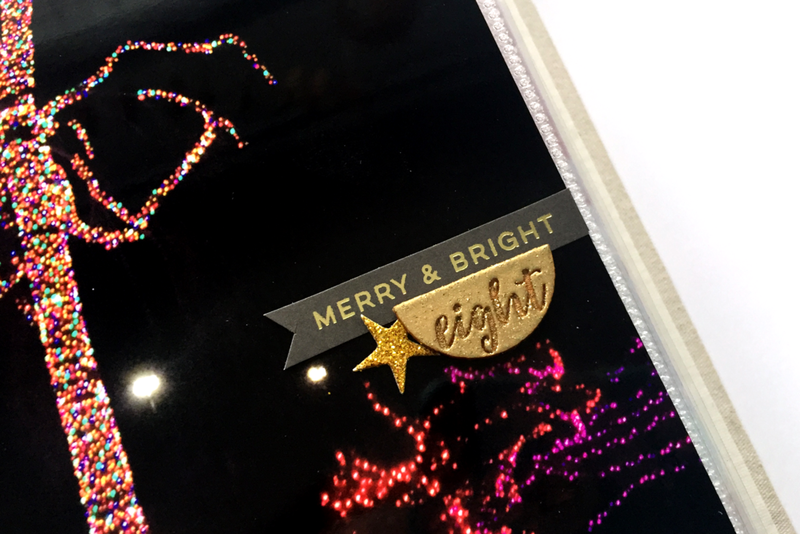 I gold embossed a wood veneer number (old Color Cast Designs) and had strategically placed the cluster so the half circle curved with the curve of the lights right below it. Love how it turned out. 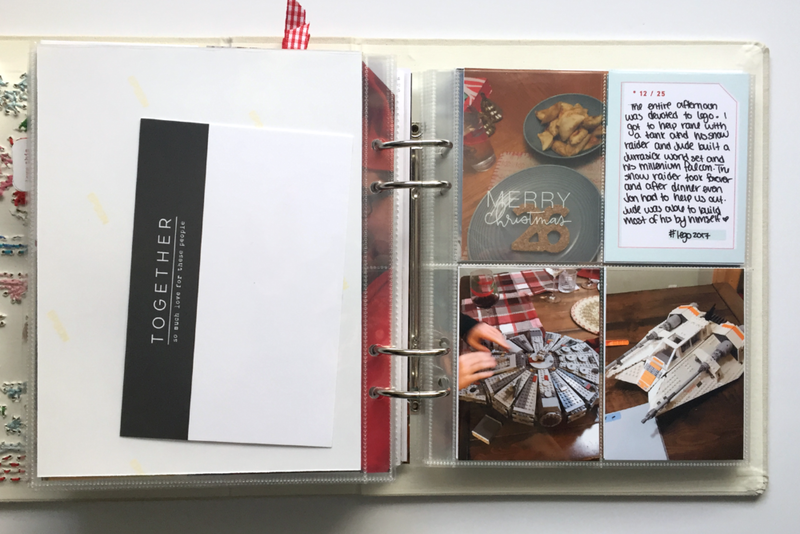 Day 8 continues with another full page photo on the back and a large paragraph of journaling next to a December box digital stamp from Ali Edwards. I added some puffy star stickers from Feed Your Craft and repeated the puffy stickers on the right page, with a puffy heart and a puffy star. I added a chipboard number 8 and one of the die cuts, also from Feed Your Craft. I make Jon give me his tickets every time we see a movie, or go to the Zoo so I can include one in Project Life and one in any other project I do related to that trip. He's so used to it by now that he just hands it to me when we get into wherever we're going. Day nine was all about a very quiet day/evening at the hotel while Jon headed to a tournament where he won a beautiful trophy. It seems weird to some I'm sure that I would spend an entire day curled up in a hotel room reading, blogging, and watching random marathons on the Food Network. My introvert self loves it though. Day ten we drove home from the city. We spent a quiet night at home with Gracie watching Holiday Baking Championship and Despicable Me 3. I added a transparent card to the bottom right pocket. Here's a better look at the transparent card. I just slipped a piece of white cardstock behind it so you could see it better. I love that card so much. Day eleven was about my very long to do list being thrown out the window despite most of the things on it needing to be completed. I shortened it down to fit on the card by leaving off two more things I didn't do, and just told the story on the top right card. I added one of the tags that came as part of the early-bird freebie for buying the main kit. I stapled the rubber piece from the Paisley Press mini kit to the felt heart and then adhered the felt heart to the tag using glue dots. I stapled the rubber piece from the Paisley Press mini kit to the felt heart and then adhered the felt heart to the tag using glue dots. Fingers crossed it stays there. Does anyone else find these 2x2 pockets so hard to fill? I wanted to use more of these in the album this year, but I can never commit to putting things in the pockets. I like to use them for "around here" words only pages, or holiday music. 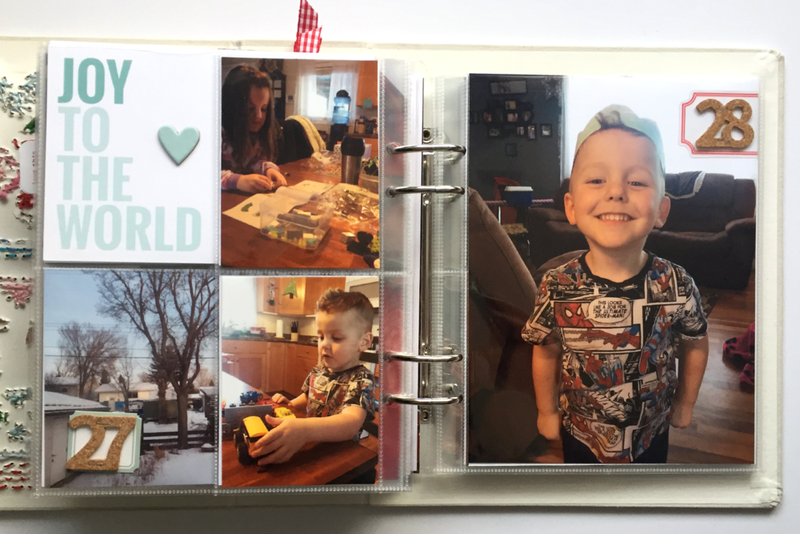 But I had a TON of photos from babysitting my niece and nephew, so I selected a few and put them in the pockets and added some embellishments. All of my journaling for day 12 is on the back of the tag. I made a 4x8 template in Photoshop and had to print it twice because the first time I forgot to factor in the holes for the rings. I used THIS STAMP SET to stamp along the top of the tag and also on the wood veneer circle. I really love the see-through bits. The rubber love square was released this year with Ali's other December Daily products and I think basically every other piece is old-ish, except the puffy heart sticker from Feed Your Craft. 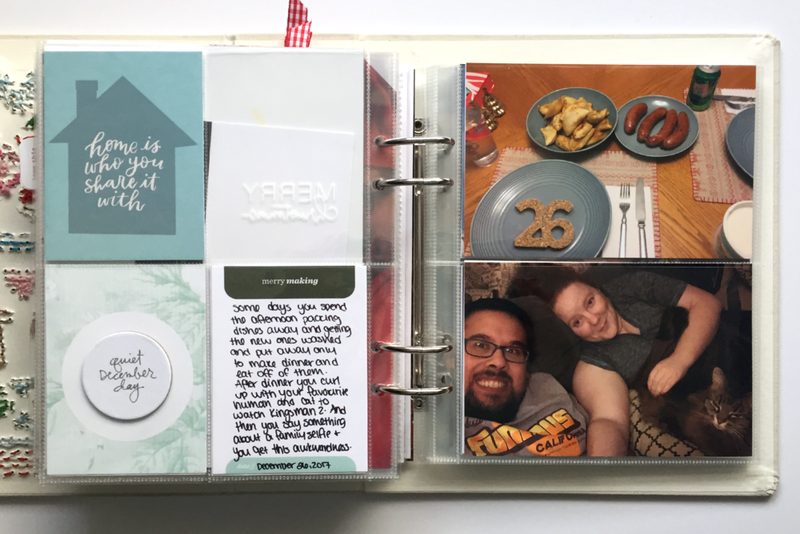 I added more photos to the back and love seeing the journaling through some of the pockets. On the bottom left corner you can basically see all the way back to Day 9. I love the see-through layers. I used the Joy from THIS STAMP SET and the pattern paper I stamped it on was actually from the 4x6 card Ali included with all December Daily orders thanking everyone for joining her for this project. I fused the embellishment pockets closed - including the 12 - and left the back of the chipboard 12 raw. Love these two kids and their silly faces. Thanks so much for coming by to check out this second installment of my December Daily album. You can check out Part 1 and on Friday I'll be back to share part 3 of 4.